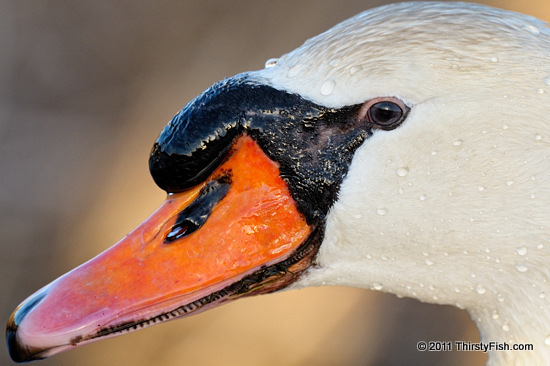 I could barely fit the face in the frame in this uncropped portrait of a mute swan. This photo can not be matted without extending the background and making room for a border. This 12 megapixel image could be comfortably printed at 24x16 inches. Assuming your photo is sharp to begin with, how big you can print is related to print resolution and viewing distance. Even with 20/20 vision and good viewing conditions such as proper ambient light, from two feet, our eyes can barely distinguish an image printed at 300dpi from one printed at 150dpi. Some photographers such as Henri Cartier-Bresson never cropped their photos on principle. They are very comfortable with the aspect ratio that they shoot in. I personally prefer the square format. I find the 3:2 aspect ratio of most digital cameras to be annoying, especially for vertical shots. If you end up with an interesting photo with proper exposure, then you should be able to crop the photo for maximum impact. Unless you are doing studio or landscape stuff, 8x10 prints at 200 dpi (3.2 megapixels) should be plenty for capturing the moment.